Global Pest Services offers a Pest Control Service that will allow your family the piece of mind 365 days a year. 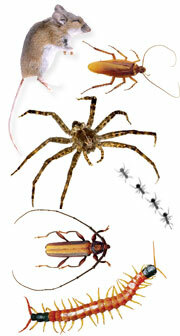 Household pests come in many shapes and sizes and Global Pest Services works year-round to keep them out of your home. Ants are prevalent in spring and summer months. Damaging rodents seek indoor cover in winter months. After a home inspection, Global creates customized solutions for whatever pest problems you have. Global offers a 1 year contract and that is automatically renewable if the customer desires. Global Pest Services has certified technicians by the Virginia Department of Agriculture to come to the home once every 3 months and treat the home’s interior & exterior for common household pests. Exterior treatment will consist of a Technician or assistant who will remove any spider webs (up to 15 ft) from the exterior of the home before treating the perimeter.